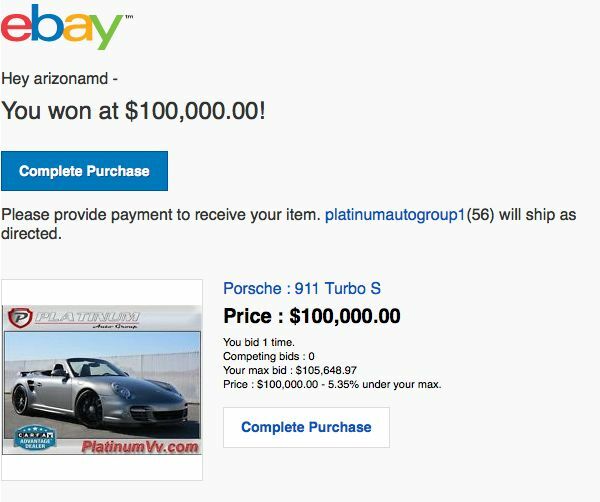 I won an auction on a 2012 911 Turbo S for $100k, but the dealer (Platinum Auto Group, Victorville CA, Platinumvv.com) is saying he forgot to place a reserve, so he doesn't have to sell it for the struck/close price. He's gone so far as to re-list it and say he has no intention of honoring the auction. They claim $100k was an unreasonable bid on the car, and I should have to pay their reserve (whcih they conveniently neglected to post or observe over the entire course of the auction). He says he'll " work with me on it" and has offered the generous price of $139,000 for an auction already won. I'm exceedingly disappointed in the lack of integrity of their dealership and management. Any thoughts on legal recourse or Ebay's ability to enforce the sale? I'm ebay illiterate. However, I'm interested in the outcome. I believe they should be held to honor what they were advertising. Good luck man. Keep us posted on what happens! Hopefully wiser people than me will respond with options, if any. Izucantc, Babylegg6.0L and Vinfin like this. First contact Ebay and Paypal. I checked into that last week. I owned one similar. Though it may not be good practice, $100K is unreasonable and the seller probably did forget to place a reserve on the car. Best of luck, either way. Goodluck. But you can't blame them for not wanting to sell a car that is worth much more for that price, I know you wouldn't feel to good about yourself If you were in their shoes. That being said, they don't necessarily have to sell you the car, they may lose a couple grand and get a bad feedback score, but that'll pretty much be it..
Great feedback and thoughts from everyone! I appreciate the input. Review of similar circumstances seems to show that Ebay washes their hands of the whole transaction by claiming variation in state laws makes a sale unenforceable. That's quite unsettling, if true, because it means sellers never have to honor a sale, and a buyer never has to follow through on a purchase. Imagine you buy your dream car from a dealer and meet their "reserve", B-I-N, etc., and they get a better offer from a customer on the lot or by phone after auction. There would be no repercussions other than bad feedback to abort their auction sale and take the higher offer! Can you imagine the gavel falling at Barrett-Jackson on a car then having the seller refuse to honor the sale, because he didn't get the price he really wanted?! I've been following the market for a while now, and $100k is a low, but not unreasonable, price on the vehicle. I turned down the purchase of a CPO'd 2011 Turbo S with 18k miles through a Porsche dealership for <$105k to bid on this one. That car is now sold, and I have a dealer refusing to honor his own auction listing. I've attached an active Autotrader listing for a '11 Turbo S with warranty for $97k to help show that the wining bid is low, but market correct. "A wolf doesn't lose sleep over the opinion of sheep"
This happened with a GTR a couple years back. The dealer forgot to place a reserve, and some guy won at $55,000. 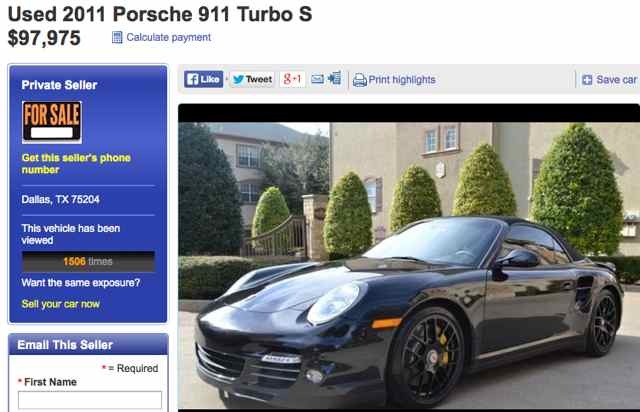 After a lot of hate from the public, they ended up selling the guy the car at that price. Put this dealership on blast, contact local news, whatever you can to make them look horrible.